Anton Ivanovich Denikin (Russian: Анто́н Ива́нович Дени́кин; IPA: [ɐnˈton ɪˈvanəvʲɪtɕ dʲɪˈnʲikʲɪn]; 16 December [O.S. 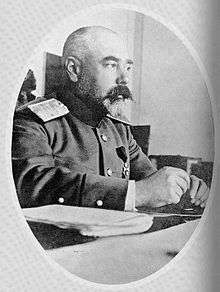 4 December] 1872 – 8 August 1947) was a Lieutenant General in the Imperial Russian Army (1916) and afterwards a leading general of the White movement in the Russian Civil War. Denikin was born in Szpetal Dolny village, now part of the Polish city Włocławek in the Kuyavian-Pomeranian Voivodeship (then part of Russian-controlled Vistula Land). His father, Ivan Efimovich Denikin, had been born a serf in the province of Saratov. Sent as a recruit to do 25 years of military service, the elder Denikin became an officer in the 22nd year of his army service in 1856. He retired from the army in 1869 with the rank of major. In 1869 Ivan Denikin married Polish seamstress Elżbieta Wrzesińska as his second wife. Anton Denikin, the couple's only child, spoke both Russian and Polish growing up. His father's Russian patriotism and devotion to the Russian Orthodox religion led Anton Denikin to the Russian army. The Denikins lived very close to poverty, with the retired major's small pension as their only source of income, and their finances worsened after Ivan's death in 1885. Anton Denikin at this time began tutoring younger schoolmates to support the family. In 1890 Denikin enrolled at the Kiev Junker School, a military college from which he graduated in 1892. The twenty-year-old Denikin joined an artillery brigade, in which he served for three years. In 1895 he was first accepted into the General Staff Academy, where he did not meet the academic requirements in the first of his two years. After this disappointment, Denikin attempted to attain acceptance again. On his next attempt he did better and finished fourteenth in his class. However, to his misfortune, the Academy decided to introduce a new system of calculating grades and as a result Denikin was not offered a staff appointment after the final exams. He protested the decision to the highest authority (the Grand Duke). After being offered a settlement according to which he would rescind his complaint in order to attain acceptance into the General Staff school again, Denikin declined, insulted. Denikin first saw active service during the 1905 Russo-Japanese War. In 1905 he won promotion to the rank of colonel. In 1910 he became commander of the 17th infantry regiment. A few weeks before the outbreak of the First World War, Denikin reached the rank of major-general. Following the October Revolution both Denikin and Kornilov escaped to Novocherkassk in the Northern Caucasus and, with other Tsarist officers, formed the anti-Bolshevik Volunteer Army, initially commanded by Alekseev. Kornilov was killed in April 1918 near Ekaterinodar and the Volunteer Army came under Denikin's command. There was some sentiment to place Grand Duke Nicholas in overall command but Denikin was not interested in sharing power. In the face of a Communist counter-offensive he withdrew his forces back towards the Don area in what came to be known as the Ice March. 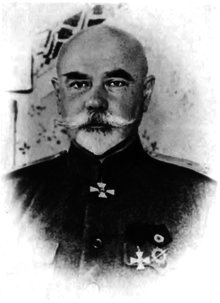 Denikin led one final assault of the southern White forces in their final push to capture Moscow in the summer of 1919. For a time, it appeared that the White Army would succeed in its drive; Leon Trotsky, as the supreme commander of the Red Army, hastily concluded an agreement with Nestor Makhno's anarchist Revolutionary Insurrectionary Army of Ukraine (the 'Black Army') for mutual support. Makhno duly turned his Black Army east and led it against Denikin's extended lines of supply, forcing the Whites to retreat. Denikin's army would be decisively defeated at Orel in October 1919, some 400 km south of Moscow. The White forces in southern Russia would be in constant retreat thereafter, eventually reaching the Crimea in March 1920. Meanwhile, the Soviet government immediately tore up its agreement with Makhno and attacked his anarchist forces. After a seesaw series of battles in which both sides gained ground, Trotsky's more numerous and better equipped Red Army troops decisively defeated and dispersed Makhno's Black Army. During the Russian Civil War, an estimated 100,000 Jews perished in pogroms during the Russian Revolution in Ukraine and also at the hands of Denikin's Whites and other anti-soviet armies. In the territories it occupied, Denikin's army carried out mass executions and plunder, in what was later known as the White Terror. In the town of Maykop in Circassia during September 1918, more than 4000 people were massacred by General Pokrovsky's forces. In the small town of Fastov alone, Denikin's Volunteer Army murdered over 1500 Jews, mostly elderly, women, and children. The press of the Denikin regime regularly incited violence against communist Jews and Jews seen as communists in the context of treason committed by Red agents. For example, a proclamation by one of Denikin's generals incited people to "arm themselves" in order to extirpate "the evil force which lives in the hearts of Jew-communists." Religious and faithful to the Russian Orthodox Church, Denikin did not criticize the pogroms against the Jewish population until the end of 1919. Denikin believed that most people had reasons to hate Jews and wished to avoid an issue that divided his officers. Many of them, intensely anti-Semitic, allowed pogroms under their watch, which turned into a method of terror against the Jewish population and served to earn the favour of the Ukrainian people for much of 1919. I had not been with Denikin more than a month before I was forced to the conclusion that the Jew represented a very big element in the Russian upheaval. The officers and men of the Army laid practically all the blame for their country's troubles on the Hebrew. They held that the whole cataclysm had been engineered by some great and mysterious secret society of international Jews, who, in the pay and at the orders of Germany, had seized the psychological moment and snatched the reins of government. All the figures and facts that were then available appeared to lend colour to this contention. No less than 82 per cent of the Bolshevik Commissars were known to be Jews, the fierce and implacable 'Trotsky,' who shared office with Lenin, being a Yiddisher whose real name was Bronstein. Among Denikin's officers this idea was an obsession of such terrible bitterness and insistency as to lead them into making statements of the wildest and most fantastic character. Many of them had persuaded themselves that Freemasonry was, in alliance with the Jews, part and parcel of the Bolshevik machine, and that what they had called the diabolical schemes for Russia's downfall had been hatched in the Petrograd and Moscow Masonic lodges. When I told them that I and most of my best friends were Freemasons, and that England owed a great deal to its loyal Jews, they stared at me askance and sadly shook their heads in fear for England's credulity in trusting the chosen race. One even asked me quietly whether I personally was a Jew. When America showed herself decidedly against any kind of interference in Russia, the idea soon gained wide credence that President Woodrow Wilson was a Jew, while Mr Lloyd George was referred to as a Jew whenever a cable from England appeared to show him as being lukewarm in support of the anti-Bolsheviks. Facing increasingly sharp criticism and emotionally exhausted, Denikin resigned in April 1920 in favor of General Baron Pyotr Wrangel. Denikin left the Crimea by ship to Constantinople and then to London. He spent a few months in England, then moved to Belgium, and later to Hungary. From 1926 Denikin lived in France. Although he remained bitterly opposed to Russia's Communist government, he chose to exist discreetly on the periphery of exile politics, spending most of his time writing and lecturing. This did not prevent the Soviets from unsuccessfully targeting him for abduction in the same effort that snared exile General Alexander P. Kutepov in 1930 and later General Evgenii K. Miller in 1937. White Against Red – The Life of General Anton Denikin gives possibly the definitive account of the intrigues during these early Soviet "wet-ops". Denikin was a writer, and prior to World War I had written several pieces in which he criticized the shortcomings of his beloved Russian Army. His voluminous writings after the Russian Civil War (written while living in exile) are notable for their analytical tone and candor. Since he enjoyed writing and most of his income was derived from it, Denikin began to consider himself a full-time writer and developed close friendships with several Russian émigré authors—among them Ivan Bunin (a Nobel Laureate), Ivan Shmelev, and Aleksandr Kuprin. Although respected by some of the community of Russian exiles, Denikin was disliked by émigrés of both political extremes, right and left. With the fall of France in 1940, Denikin left Paris in order to avoid imprisonment by the Germans. Although he was eventually captured, he declined all attempts to co-opt him for use in Nazi anti-Soviet propaganda. The Germans did not press the matter and Denikin was allowed to remain in rural exile. At the conclusion of World War II, correctly anticipating their likely fate at the hands of Joseph Stalin's Soviet Union, Denikin attempted to persuade the Western Allies not to forcibly repatriate Soviet POWs (see also Operation Keelhaul). He was largely unsuccessful in his effort. From 1945 until his death in 1947, Denikin lived in the United States, in New York City. On August 8, 1947, at the age of 74, he died of a heart attack while vacationing near Ann Arbor, Michigan. General Denikin was buried with military honors in Detroit. 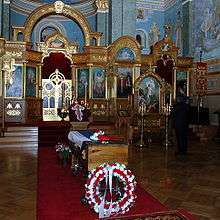 His remains were later transferred to St. Vladimir's Cemetery in Jackson, New Jersey. His wife, Xenia Vasilievna Chizh (1892-1973), was buried at Saint Genevieve de Bois cemetery near Paris. Wikimedia Commons has media related to Anton Denikin. Republished: Hyperion Press. 1973. ISBN 978-0-88355-101-1. Republished: Ian Faulkner Publishing. Cambridge. 1992. ISBN 978-1-85763-010-7. ↑ Florinsky, Michael T. (1961). Encyclopedia of Russia and the Soviet Union. McGraw-Hill. Retrieved 2013-07-12. ↑ Mayer, Arno J. (2000). The Furies. Princeton University Press. p. 520. ISBN 9780691090153. Retrieved 2013-07-12. ↑ Kenez, Peter, "The Ideology of the White Movement," Soviet Studies, 1980, no. 32. pp. 58–83. Christopher Lazarski, "White Propaganda Efforts in the South during the Russian Civil War, 1918-19 (The Alekseev-Denikin Period)," The Slavonic and East European Review, Vol. 70, No. 4 (Oct., 1992), pp. 688–707. Viktor G. Bortnevski, “White Administration and White Terror (The Denikin Period),” Russian Review, Vol. 52, No. 3 (Jul., 1993), pp. 354–366. ↑ John Ernest Hodgson ("War Correspondent with the Anti-Bolshevik Forces"), "With Denikin's Armies: Being a Description of the Cossak Counter-Revolution in South Russia, 1918-1920", Temple Bar Publishing Co., London, 1932, pp. 54-56. The standard reference is Dimitry V. Lehovich, White Against Red - the Life of General Anton Denikin, New York, W.W. Norton, 1974. This book is also available in Russian in two versions: then abridged text is Belye Protiv Krasnykh, Moscow, Voskresenie publishers, 1992. The second, unabridged, is Denikin - Zhizn' Russkogo Ofitsera, Moscow, Evrasia publishers, 2004. Anton Ivanovich Denikin. Biographies at Answers.com. Answers Corporation, 2006.